I just got my first Luxeon’s in and I love them. Admittedly, I haven’t tried the 4040 footprint Luxeon V’s. But I just picked up some of the 4000K (tested) and 5000K (yet untested) V2’s (the 3535 footprint version) and I must say, I’m impressed. I replaced a 4000K 70CRI V5? XP-L2 in a 3.08A Convoy S2 with a smooth reflector. Not sure where the battery is at voltage-wise, but I measured 1096 lumens for the XP-L2. I swapped in the Luxeon V2 and measured 1054 lumens, only a 42 lumen difference. But the beam and tint and tint consistency is spectacular. No green, no yellow, no tint shift. Just bright, beautiful, creamy white. Oh yeah, a new favorite. And they were < $2 each. And fit on a standard 3535 board. Heck yeah. Hmm. What is the V2 vs the V?? 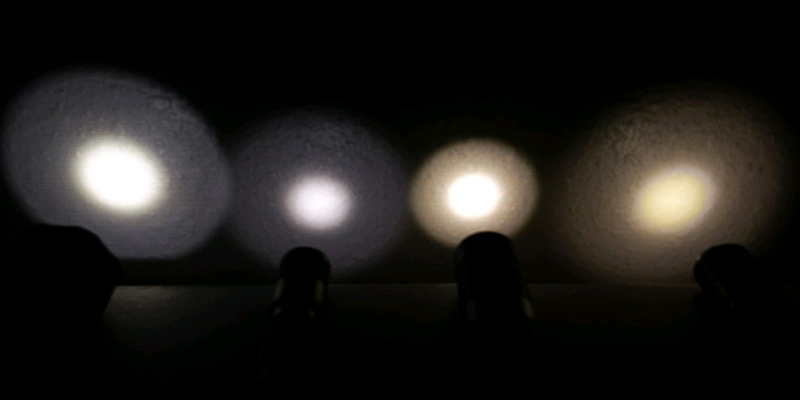 Left to right: Convoy M1 with 70CRI XP-L 5000K, UltraTac A1 with 90CRI 219B (I thought 4000K but maybe not), Convoy S2 smo with Luxeon V2 70CRI 4000K, Wuben E05 with 90CRI XP-L2 80CRI. So is it a different LED than the V or is it the same but with a 3535 footprint? It seems to be quite similar, but perhaps not the same. I’m anxiously awaiting proper tests. Anyone care to volunteer? Djozz? Texas Ace? Koef3? Maukka? I’d probably donate some if there’s interest. I would be interested in seeing someone test this too. XP-L2 can work well with a frosted or pebbled TIR though. Luxeon V has 4mm2 die, V2 has 2mm2 die. Agree, not sure I was able to explain it well but glad you had similar results. This LED should compete with any 70 CRI LED out there and has a good balance of output, tint and uniformity with a good price. It’s flip chip, right? Does it have any throw? Comparing two Convoy S2’s side by side; one with LH351D and one with Luxeon V2, the throw of the Luxeon V2 kills the LH351D. But that doesn’t take much, the LH351D is a very floody LED. Do those numbers sound right? Since these aren’t real throwers (perhaps with the exception of the C8), should I measure at 3m (or even 1m) instead of 5m? Without being scientific it does appear to have more throw than a LH351D but with the dome on I don’t think anyone would consider this a thrower. Not sure how it performs dedomed and I think thus far only gchart and I have even tried them in a flashlight. I have a C8F with 3x Luxeon V and when I compare it next to a LH351D of the same type there isn’t a huge difference in the overall beam. It’s a more intense hotspot but not by a huge amount. If I’ve got time tonight I’ll try getting side-by-side numbers with the same flashlight setup using Luxeon V2, LH351D, XP-L, and XP-L2. I’ll see what else I can scare up, maybe a XP-G2, XP-G3, SST-20, XP-L HI. I’m pretty sure I’ve got all of those on hand, it’s just how much time I’ve got to swap in and out a bunch of different LEDs. 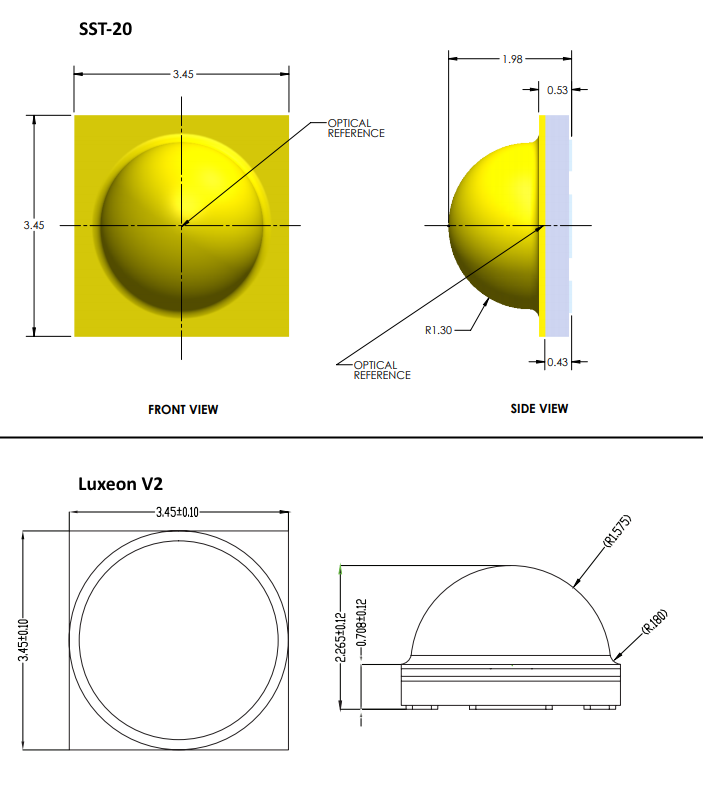 Here’s a mechanical comparison of the domes of the SST-20 and Luxeon V2. SST-20 is quite a bit smaller in all dimensions and LH351D is slightly larger in all dimensions. Wow. Having 1/2 the die size REALLY helps with throws. 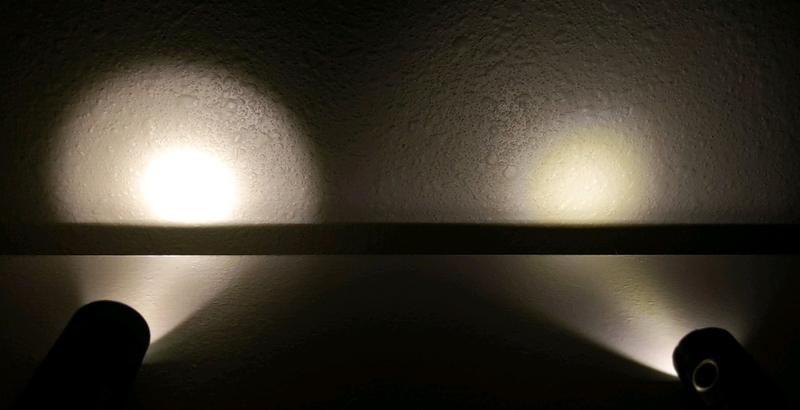 Then again, the LH351D is a 90CRI emitter, so the results aren’t TOO accurate, but are representative of real life. Ok… here’s some data points. I can’t say that these will be consistent with what others may gather, but they should provide a fair comparison against each other since they all came from the same flashlight, same battery, same physical measuring setup, etc. These tests done at ~10 seconds and 3 meters. Do you have 5 lights or you swapping led’s? That was from swapping LEDs into the same light, driver, battery, etc. Wow, thanks for the effort. I am interested in these but just don’t know where I would use one. The comparison to SST-20 is especially telling. V2 gets 11.2 lx/lm while SST-20 gets 19.2. So….in my book it counts as a pure flooder LED. I was pretty shocked by that, I bought 10 of the SST-20 a while back when they were first announced and all that was available was cool white. But I strongly dislike cool white, so I never ended up putting them in anything. I’ve heard the chatter and knew they could throw, but I just didn’t expect the lux to be that much higher, even over the XP-L HI (with the SST-20 still having it’s dome on). What if you put it up against a XP-L HI V3 1A 6500k? Seeing how light meters supposedly read/register CW higher? Maybe this emitter is better suited for aspheric and recoil lights. I think I read somewhere in djozz's thread that something like 90% of the output is goes forward. Wouldn't that mean less light hitting the reflector (in a reflector light) which would result in less throw? Maybe this emitter is better suited for aspheric and recoil lights. I think I read somewhere in djozz’s thread that something like 90% of the output is goes forward. Wouldn’t that mean less light hitting the reflector (in a reflector light) which would result in less throw? The radiant power chart doesn’t seem much different from SST-20-W.